LCS ALUMNI – What’s new? Do you have a new address or email that needs updated? Be sure and contact us with your new information. LCS desires to stay in touch so that you can be informed about life at your Alma Mater as well as upcoming events for Alumni. Send an email to alumni@lansingchristianschool.org with your name (including maiden, if appropriate), graduation year, address, email and cell #. We would love to hear from you! Food will be “picnic pot-luck style”. As hosts we will be providing grilled and smoked wild game, table service, water & lemonade. Please bring a side dish AND a salad OR dessert and your own beverage if you prefer. We will have proper accommodations to keep dishes hot or preserve cold as the day progresses. Dinner will be casual “buffet style” with a bon fire in the evening. We hope you will join us under the big canopy, sitting at a shaded patio table or around the fire pit. Praying for safe travels for all who come near and far. We’d love to see & “catch up” with you ALL! 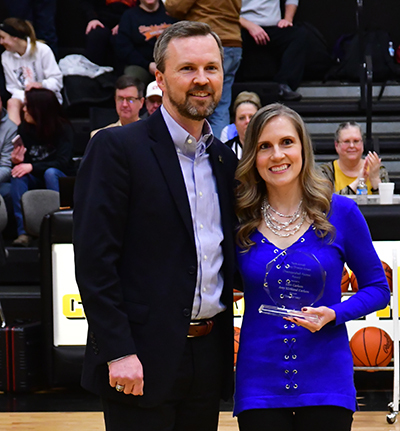 The Distinguished Alumni Award is given each year to an alumnus who exemplifies integrity and Christian character whether on the job, at home, or in the community. They have also remained loyal to LCS through their partnership with the school in a variety of ways. This year’s recipients of the Tenth Annual Distinguished Alumni Award are Lars and Amy Kirkland Carlson. Lars started at Lansing Christian in the 4th grade and Amy in the 9th. Both were involved in chorale, musicals and plays as well as athletics. If you haven’t guessed, they were also High School Sweethearts. 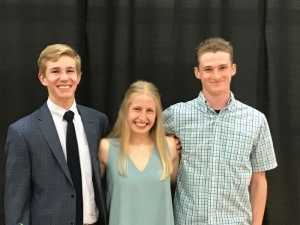 Their college years were spent at LCC, Western Michigan, Liberty University, and MSU where Lars earned his Master’s in Business Administration. Lars had high hopes of being an airline pilot but God had something different in mind. After being here and there, they made their home at Youth Haven Ranch in Rives Junction where Lars grew up. His parents and grandparents founded this ministry and Lars and Amy joined it more than 21 years ago. Lars now serves as President and CEO while Amy serves as Director of Marketing & Communication. 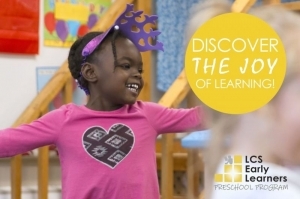 This ministry provides year round Christ-centered experiences for disadvantaged children in the Lansing area. Having a place where kids can get away from their struggles and know what it is to be loved and accepted is in the heart of Lars and Amy. Lansing Christian has partnered with Youth Haven for the past few years as we send students to help prepare the grounds in the spring during our Service Week. When time is free for them Lars enjoys playing the drums, flying an airplane, and a few techy things. Amy works on her writing, digital scrapbooking, baking, and singing. And they have been raising 2 boys age 16 and 18. 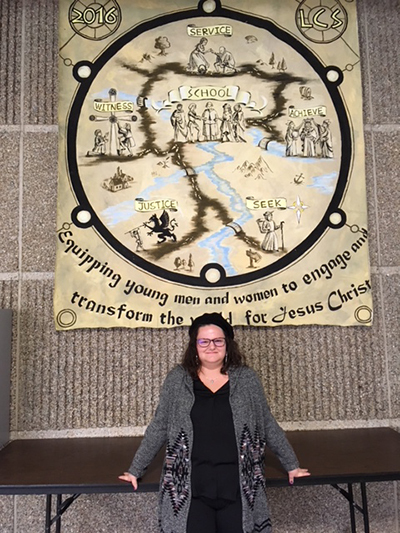 The 2018 recipient was Melanie Jabara Seal (class of ’88). 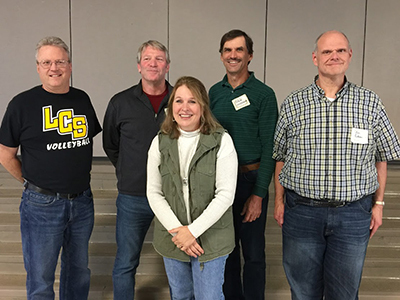 The 2017 recipients were Jason and Kristin (Clark) Peters (class of ’82), 2016 recipient was Randy Hebden, the 2015 recipients were Jeremy Van Antwerp (Class of ’90) and Bob Isenga (Class of ’63), the 2014 recipient was Rock Campbell (Class of ’69), the 2013 recipients were Heidi DeVries and Buck Hagy (Class of ’84), the 2012 recipient was Chad Mcree (Class of ’80) and the 2011 recipient was Cathy (Bowden) Bytwerk (Class of ’69). Contact Cathy (Bowden) Bytwerk cbytwerk@lansingchristianschool.org with any questions. 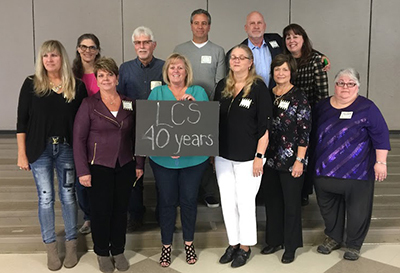 The class of 1978 gathered together to celebrate their 40th reunion! Joining them were the classes of 1979-1980. 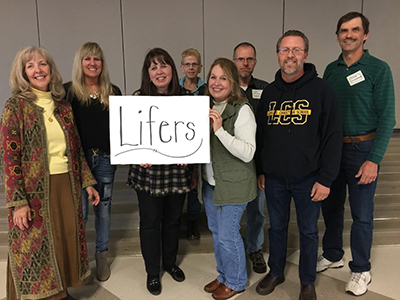 Among those who came are a group of “Lifers” who attended LCS since Kindergarten. Thanks to Penny Bellon Imeson for orchestrating this group of Pilgrims and sending in the pictures. Check out the Alumni group on Facebook to see more. Adair Cutler, class of 2017, is shining bright on the Volleyball team at Hope College! Click this to read about her sports success. Recently Tanaya Graziano, class of 2015, spent 6 months with YWAM (Youth With a Mission) travelling in Europe sharing Jesus Christ. 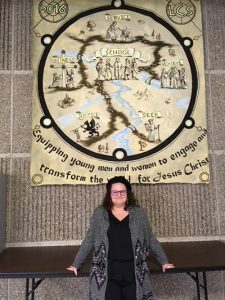 After attending Discipleship Training School in Perth, Australia, she was placed in a group of 8 girls that went to Slovakia, Germany, Romania, and Bulgaria. Everywhere they went they had the opportunity to bring light to the lives of the elderly, children living on the street, girls caught up in trafficking, and much, much more. As she has reflected about her time of ministry she has learned that truly following Jesus is an adventure and His timing supersedes hers by a longshot! Her hope for the future is to become involved in social work whether in the states or abroad. Counseling to women who have come out of prostitution and trafficking is something that is tugging at her heart as well as helping to raise the awareness of this injustice in our world. She has set her hope in God and with His guidance she is helping to transform the world for Jesus Christ. On February 14, 2019 Lorie Lela Forgar Bennett passed away after battling brain cancer for several years. Lorie was a graduate of the class of 1982. During her time at LCS Lorie was involved in choir, the high school play, and the yearbook staff. A funeral to remember Lorie was held in Kalamazoo, MI on February 21, 2019. 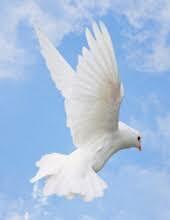 Our sympathy is extended to the Bennett family. Click here to see her obituary. David John Benson was born on February 6, 1964 and raised in Lansing. He graduated from Lansing Christian in the Class of ’82. Dave spent time in St. Ignace over the years, working in the tourism business. He moved to Northville and worked at Little Italy for a few years before moving back to Lansing. He last resided in Gaylord with his 2 dogs. He passed on to heaven on March 24, 2019. He was preceded in death by his parents, Dr. Donald and Marylan Benson. If any of you are celebrating before the year ends be sure to send pictures and updated contact information. 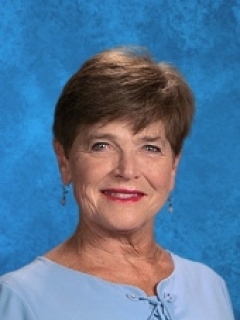 Contact Cathy Bytwerk cbytwerk@lansingchristianschool.org, Alumni Coordinator. Click here for Christmas Concert or All-Alumni Reunion photos. 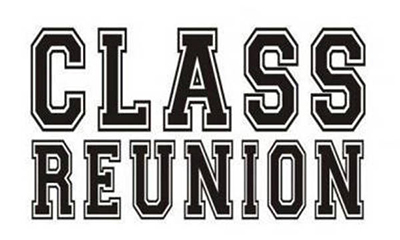 Click here to see photos and descriptions of past reunions. Click here to view a copy of the Pilgrim Journey.